Looks more like a wood fired Locomotive and they throw sparks like that, my tug does that at night too on firewood. Coal and pulling that hard there would be black smoke and the embers falling look very light floating sideways, coal embers are very heavy. Not logical that a coal train would be burning wood, but it definitely looks like a wood fire. 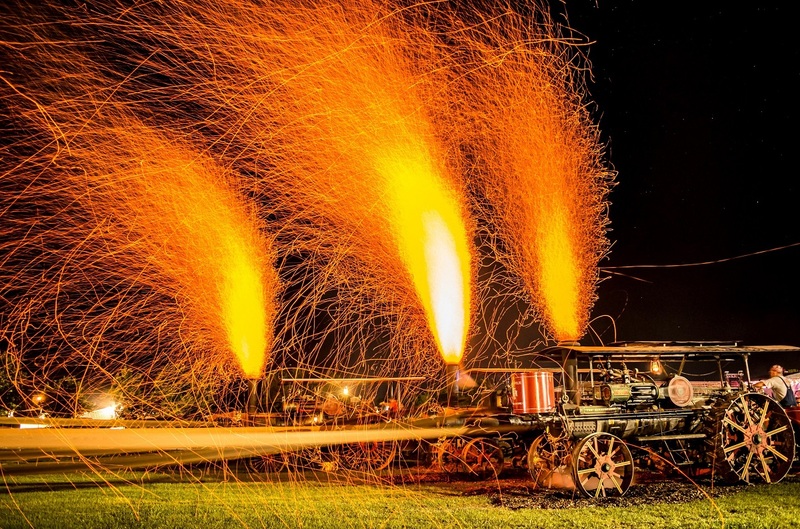 They might be throwing sawdust in the firebox for a spark show, very common at traction engine events. Not sure, I don't think it would do that as it is much heavier. The wood "dust" is much lighter and can be carried all the way through on the draft. That is probably what was going on in that video, a spark show with sawdust for photographic effect. Someone in the comments mentioned that is from not dumping the ashes, ash is already burnt, ash with a hard draft tends to put the fire out. Some of the Brit steamboaters run water in their ash pan, it wets the ash and prevents it from being pulled in to the combustion chamber. On the Tug, I have to keep the ashes pulled regularly or it doesn't burn well. Early wood-fired steam locomotives in the USA used big cone-shaped ash/cinder catchers on their smokestacks, to avoid spitting sparks out the stack. Very important when running through the dry grasslands of the Wild West -- these, and "cow catchers", often appear on locomotives in cowboy movies. Coal fuel and "bob wahr" later made these features obsolete. Sorry for the late response but I don't get on here as much as I like. That engine is burning "coal" and I use the term very loosely as they run them on mostly coal dust which causes the volcanic eruptions.